He was born in Kalbajar region on the 31st of August, 1967. He went to first grade in Alabashli village of Khanlar region in 1975 and finished Gargujag village of Goranboy region in 1985. He entered Baku School of Supreme Commanders due to his huge interest in the army. Yunis continued his education in Chelyabinsk Tank School after he finished the second course in Baki. He was promoted to the rank of a lieutenant in 1989 and started his military career in one the military units in Chelyabinsk. He was expelled from the army due to his active political meetings against the enemies after the events of Black January in 1990. Then, he returned back to Baki and started working at the Department Bilajari Railway station. He was also very much interested in sports and was nominated as a master of Sambo. When the country was in need of the protectors against the vultures that wanted to tear the country apart, Yunis voluntarily joined the war and was appointed as a company commander within the unit # 701 in 1991. The brave fighter was actively participating in defense of Karkijahan and Malibayli villages as well as Shusha city. After a while he was sent to Baki in order to train new soldiers. But Y. Najafov returned back to the front line again when Shusha and Lachin was under the enemy invasion. He was also fighting in Kalbajar region and took an active part while taking back several invaded villages of the region. The last battle of the head lieutenant Y. Najafov was on the 24th of August, 1992. He was killed while protecting Vang village from the enemy invasion and became a martyr. 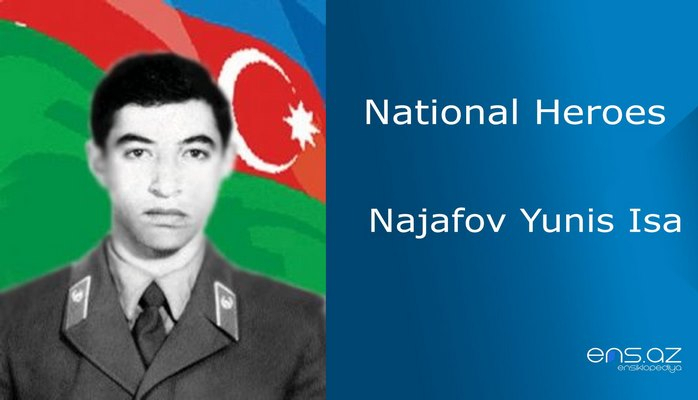 Najafov Yunis Isa was posthumously awarded the title of the “National hero of Azerbaijan” by the decree # 350 of the president of Azerbaijani republic on the 7th of December, 1992. He was buried in Gargujag village of Goranboy region. And there is a monument of him both in Goranboy region and Bilajari district.